I'm going to post a little more on NYFW and Fashion's Night Out in a few days, but today, I have for you a wonderful creation from SoFlaJo. Halloween is a little over a month and a half away, but Jody's Terrified Collection is bringing the scary spirit to your nails! Here is the full collection above... STUNNERS! 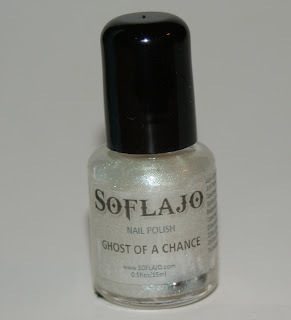 I had the opportunity to try out Ghost of a Chance, a crystalline shimmer polish that doubles as a blue-green top coat! Here, you can see the ghostly-presence of the green and blue shimmer. 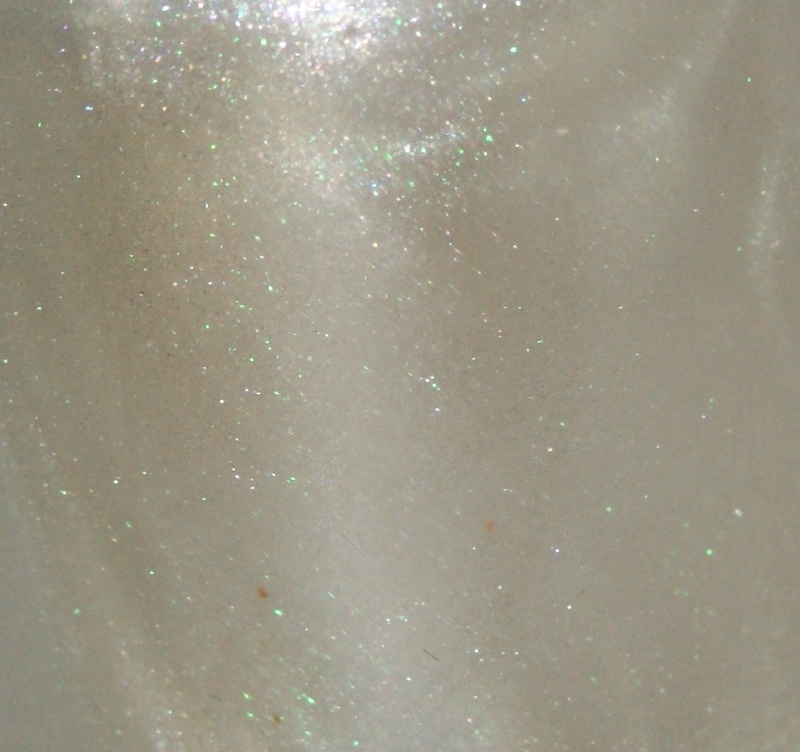 Because of the undertones of the glitter, I chose to layer Ghost of a Chance over a range of dark blues and black. From left to right, there are two coats over Zoya Indigo, Zoya Ibiza, Zoya Song, and Zoya Tart. I think it gives them all a gorgeous depth that a plain creme or frost just can't portray on its own. Though, I think it looks the BEST over the black because it gives the green the most pop! While this definitely has the look of fall, I think this will be amazing for an icy winter look too! 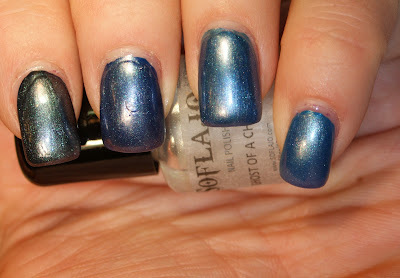 Like all of SoFlaJo's polishes, the application was outstanding. She really knows how to do awesome, transformative top coats! Handcrafted, all polishes are made from natural pigments and glitters with bases free of the chemicals Toluene, Formaldehyde and Dibutyl Phthalate and Formaldehyde. 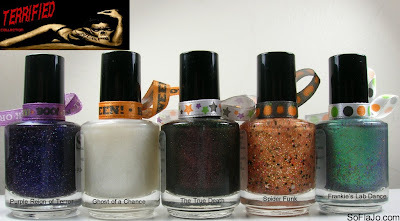 You can purchase any and all of the Terrified Collection now at the SoFlaJo Etsy Shop. Mini bottles are available for $5 (7mL) and the full size bottles are available for $10 (15mL). The 5-piece Terrified Collections (available in mini or full size) have deep shipping discounts too. BONUS! What do you think of Ghost of a Chance?